Opened in 2008, our hotel / guest house is situated in the middle of the tourist centre of Nha Trang beach city (called foreign area), surrounded by many restaurants, cheap street food, bars, tourist agents, shops, minimarts â¦ and specially, you need only 3 minutes by foot to Nha trang beach! 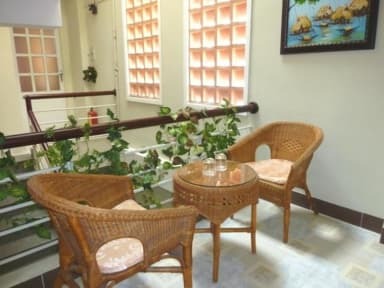 Equipped by all modern facilities like beds, air-conditioner, mini-refrigerator, cable tivi, electric fan, hot shower, internet Wifi ... , our rooms promise you a very good stay and vacation with budget rate. We have family rooms for 2 - 6 persons for you! Our friendly staff will serve you and organize special Tours for you, like snorkeling, diving, island boat trip, aquarium, mud & mineral water bathing ... in Nha Trang and others tours to Hoi An, Mui Ne, Da Lat, Hanoi, Hochiminh city, Halong Bay â¦.